“Hello darkness, my old friend…” I hear the familiar words of the song and my breath begins to slow. Today I’m listening to the version of the song by the band Disturbed, rather than Simon and Garfunkel. The grit in the singer’s voice, the richness of his tone along with the familiar words draws me in as I sit in the sounds of silence. (See what I did there?) This version feels closer to how I feel… as if the singer truly knows what darkness is, as I do. I’m not a big candle person but the sea salt/magnolia candle I bought in Savannah last year is my absolute favorite and I only burn it every so often; I can’t find it in stock anywhere on line and I refuse to live in a home without this scent that I call upon to bring myself into a particular head space. This head space is tricky; it can go either way, depending on the variables of my home. For instance, if my living kids or Grandbabe are awake the wick does not get lit; the headspace doesn’t get quite right. The soft scent of this candle does not interact with squealing kids or incessant questions pertaining to food or “what activity can I do next”, well. I don’t get a quiet house very often (an amazing blessing, of which I’m most thankful) so on the rare occasion that I do, I sit in the rocking chair I was given when pregnant with Caleb, wrap myself in the prayer shawl I received in the hospital when I had him and light my candle in a darkened room. Have you ever sat in a room devoid of any light except for the faint flickers of a candle in pure silence? The stillness envelopes you and the everyday things in that room look different, somehow. I love sitting in rooms like this, especially when a yummy smelling candle is involved. I search for “Sounds of Silence” on my Spotify playlist named “Grief” (yes, I in fact have a playlist for my sad days) and my senses come alive. Between the scent of the candle, the luscious melodies of the song and the flickers of the candlelight I feel at home. Cozy. Familiar. “Hello, Darkness, my old friend. 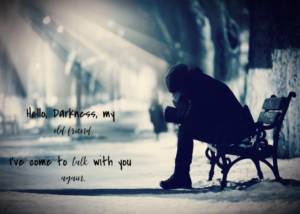 I’ve come to talk to you again.” My darkness is my grief which at this point has become my old friend. I know him well. I can feel his presence when he comes to visit me. Somedays it’s not him who visits me, though – it is I who visits him. Some days I need a visit with him to hash some things out, to process nuances I have only recently discovered along my grief journey. Hence the playlist. 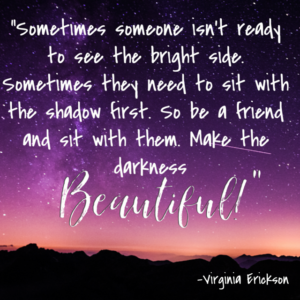 Today I am willing my darkness, my grief, to visit me because I need to wrestle with him about a concept I’ve been gnawing on for quite some time – the bright side. For years the term “at least” has been thrown out at me in an effort to find the silver lining – the perpetual need to put a preverbal bow on a messy situation to make it “complete”. To make it “fit” inside someone’s view point. “At least they died early”. “At least you’re still young, you can have another baby.” “At least he died before you could really know him.” The “at leasts” have been hurled at me as a (mostly) genuine means of comforting me and although I’ve had a less than stellar attitude about them, I’ve come to appreciate the attempt at thoughtfulness behind them. I’ve wrestled and come to terms with, “at least”. The bright side, however, isn’t something I’ve thought about for quite some time until a recent visit with my In-laws brought it back into the forefront. My In laws came to Colorado to visit us several weeks ago which was wonderful because they live in Michigan and we don’t get to see them often. My mother in law, Judy, and I were having a conversation one day during their visit and she was marveling at the life my husband and I had built together over the last fifteen years. She mentioned that had Caleb not died, we likely wouldn’t have our living children and we wouldn’t have The Beautiful Scar Project; there was, after all, a bright side to the pain we had endured. I felt my heart skip a beat and felt short of breath because the bright side concept hadn’t been mentioned by anyone in our lives for quite some time and it took me by surprise. I changed the subject because I wasn’t prepared to face the bright side in that moment as I needed to sit with her words, mull and dissect them, to figure out how I felt about them. She of course wasn’t saying she was glad Caleb, Jackson, Grace or Reagan had died. Not by any means. She was pointing out how beautiful and rich our lives are, despite the tragedies we have endured. She was pointing out the blessings we have received and the good we are doing in the pregnancy and infant loss community by starting The Beautiful Scar Project. She wasn’t being hurtful or unkind in any way. She was reminding me of how far we had come, how many battles we have fought and won, and telling me she was proud of us for the life we have built; messiness and all. As I summoned my old friend, Grief, to mull the bright side with me, I replayed Judy’s words over and over to examine them. In the back of my mind and in hushed conversations between my husband and myself, lived the words “what if” that every once in a while we would take out, discuss, and, when no solution presented itself, put back. Reconciliation of the “what ifs” and the bright side has never occurred because, to us, it was saying that it was OK that our angel babes had died. It is, emphatically, most certainly NOT OK. So in the back of my mind, it stays; unfinished. Not Reconciled. Judy’s words made it necessary to bring the bright side out of the darkness and see if there was a way for reconciliation to occur. I played “Sounds of Silence” on repeat as I looked around the room, admiring the beautiful darkness penetrated by soft flickers of light. I looked at the memories we have displayed throughout the room; grief books and devotionals that were my life line in the early days of raw grief. Books on foster care and adoption that were my life line when we were learning to be parents of kids from hard places. Photos of our children, both living and not, displayed proudly, along with the five candle memorial used on special occasions to set intentional time to remember our four angel babes. I zeroed in on the five candle memorial because those five candles have been a source for hope, grief, love, courage and memories for seven years. The five candles weren’t lit this particular evening but their meaning permeated the entire room allowing me to finally let go of my discourse with the bright side. I realized that the bright side would never be reconcilable for me due to the tension of my heart living on two sides of heaven. I was attempting to force a square peg in a round hole; the bright side simply won’t fit for me. And for the first time – that was OK. For Judy, the bright side is possible and that is a lovely thing. Her perspective is valid and I love that she has found beauty and healing in the bright side. It makes me incredibly happy, in fact, to see her revel in the bright side and what that means for her. For me, however, I find beauty and healing in the darkness, saturated by soft flickers of light. The place of being unsure; of not reconciling, not tying the bow, not forcing something to fit where it doesn’t. I take comfort in this sacred space, of darkness split by light, and touched by the sound of silence. And my sea salt/magnolia scented candle.